Place the flour, almonds and icing sugar into a bowl and rub in the butter until it is like crumble. Add the egg and the almond essence and mix to a paste. Chill for 30 minutes. 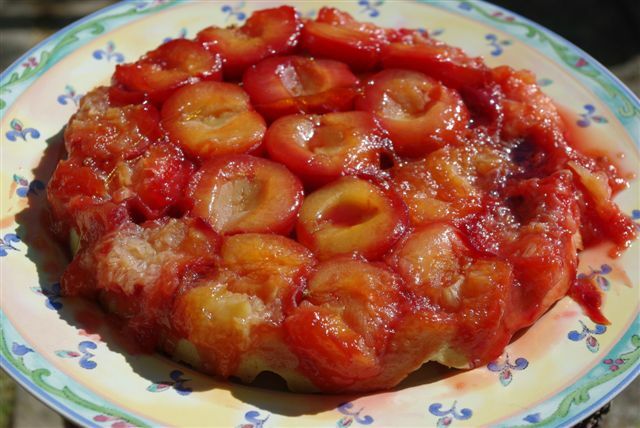 Halve the plums, remove the stones, and place them cut side down tightly in the cake tin. Place the granulated sugar into a saucepan and heat gently until it caramelises. Pour this over the plums. Alternatively you can just sprinkle the sugar over the plums without caramelising it or replace the sugar with a little honey. Using half the pastry (the rest will freeze well) roll out to the size of the cake tin keeping it reasonably thick. Place the pastry over the plums tucking the edges well down the sides. Place the tin on a tray and bake for 25-30 minutes at 180 C. Invert onto a plate (take care as the juices are very hot) and serve immediately. For this you will need an 8 inch shallow cake tin.